do you remember that old saying, "If you can't take the heat, then get out of the kitchen"? Well, it's been so hot here lately that is exactly what we decided to do! Hubby and I headed out on Monday towards the Oregon coast in search of cooler weather. 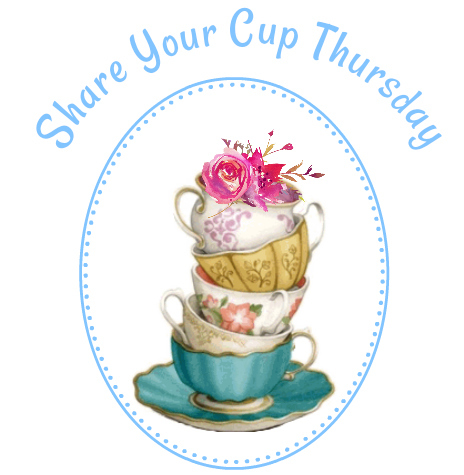 Because of this, there will be no Share Your Cup this week. I haven't shared our basement kitchen for a while. I thought the red and white décor would be perfect for this hot sizzling summer. I bought the bench at a yard sale for $40. I painted it red, waxed it with dark wax, and added a grain sack stripe to the seat. We are deep into the wonderful season of fresh fruit. Some of these were gifted to me, some I bought new, and quite a few were found at thrift shops. When we finished our basement, the original plan was to hang a microwave oven between the open shelving. I decided it would take away from the old fashion farmhouse feel I was going for. Last year our son and his family lived with us for 8 months while their new home was being built. They surprised me with this red microwave. They were so excited to show it to me because it was red. They knew I would love it, and they were right! I decided to not worry and just leave it out on the counter. The older I get, the less fussy I am. 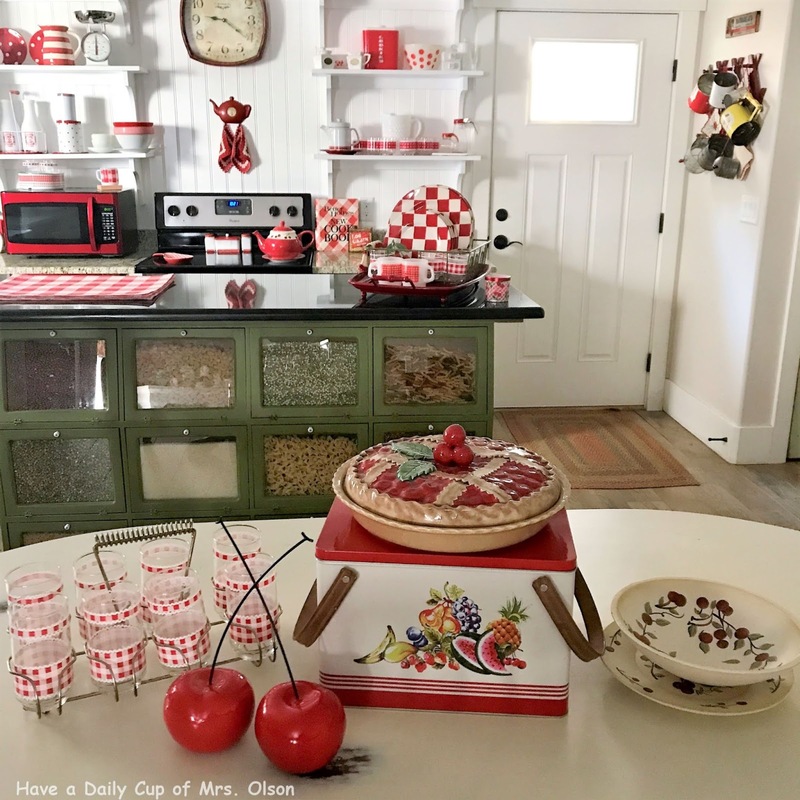 I have quite a collection of red and white cherry themed dishes. They are housed in my glass front cupboard and hoosier cabinet. I'll save them for another day. I hope you enjoyed our red hot sizzling kitchen! Please remember to return next week for SYC. 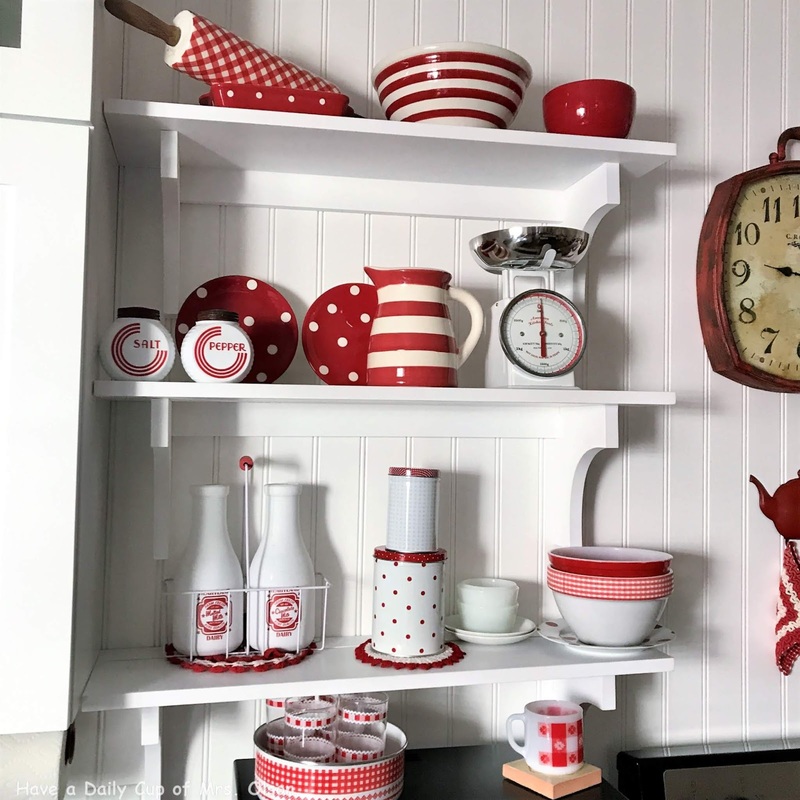 My goodness Jann, love your very happy basement Kitchen in Red and White (well mostly red and white - there are some very nice green touches too). Have a great trip along the Oregon Coast - beautiful place to drive along and stop when you want. Hi Jann!Stunning red and white kitchen!I am envyous,I want one like yours!Thanks for such inspiration and enjoy your time.Hugs!Maristella. Oh my goodness Jann, your basement kitchen is the cutest thing ever!! I'll bet your son and his family hated to leave. How darling is the red microwave that they gifted you. You made the right decision is leaving it on the counter. I could move right in and be so happy with all that sizzlin' red (my favorite color)! Have fun on your trip...you deserve it! Oh my your red and white basement kitchen is wonderful. Love it. I had forgotten about your basement kitchen....darn! Great share, and I bet a little cooking could go on down there. I know I want to do some canning, but it is so hot, that we are throwing tomatoes in the freezer for later. Hope you have a wonderful, cool trip. I hope to paint my kitchen white sometime soon. Finding the right white isn't as easy as one would think! 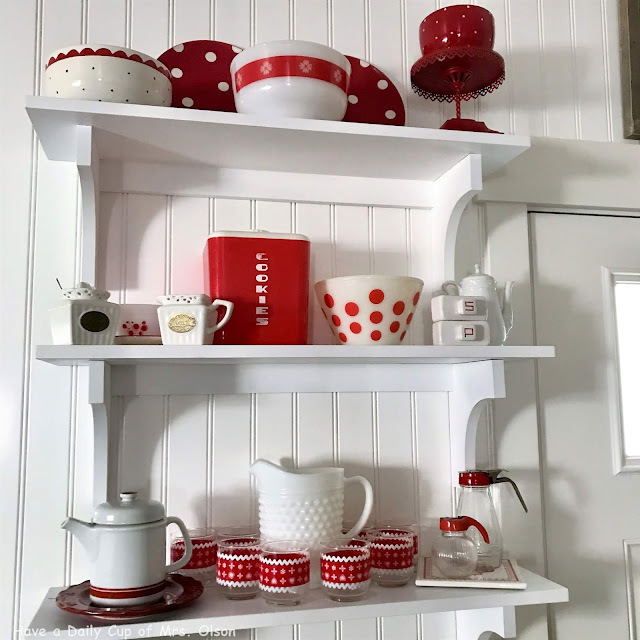 I've been collecting red for the kitchen, too. My family got on board. My husband gave me a red Kitchen Aid blender for Christmas. My son gave me a red Cuisenart ice cream maker for my birthday. And I bought myself a new Kitchen Aid stand mixer when they went on sale a couple of weeks ago. I'd been needing a new mixer for a few years. I haven't even got it out of the box yet. Too hot to bake! Jann, I just love it! 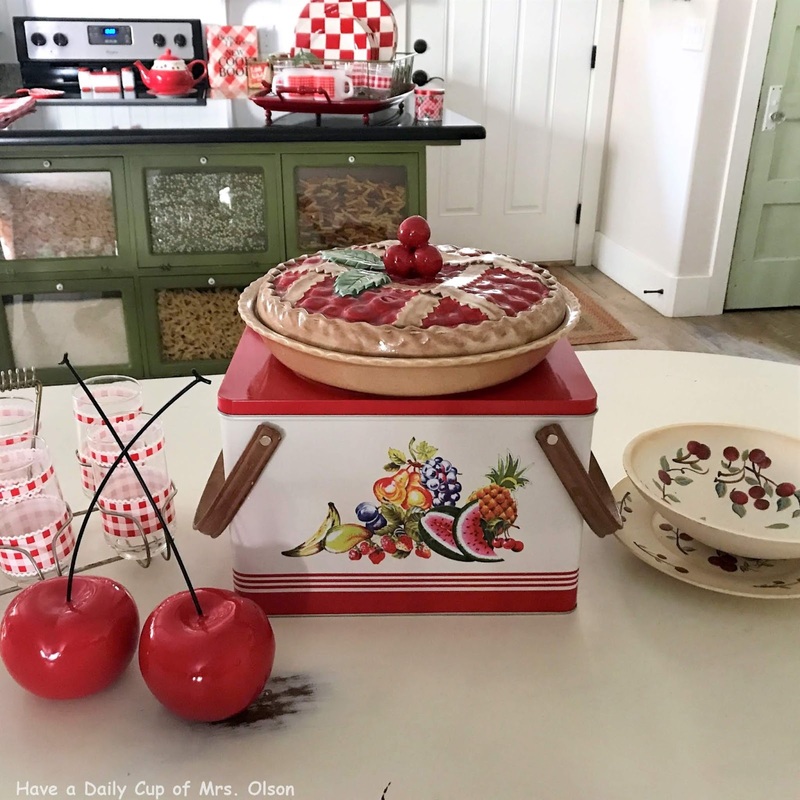 Red is my favorite kitchen color. I've never seen a red microwave before. It's very pretty. I LOVE your red hot kitchen! I am asking myself why I didn't do my kitchen in red??!! 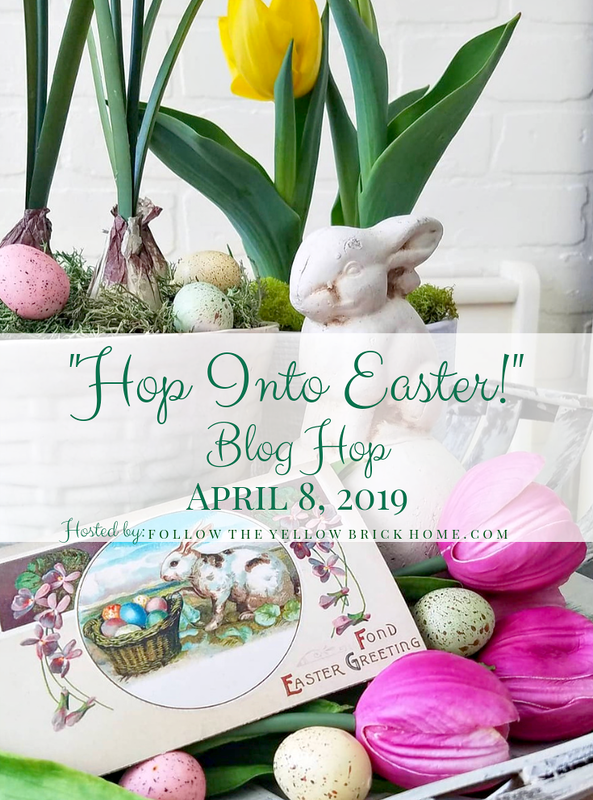 Of course I would not have all of your fabulous dishes and collections to decorate it with, but I am inspired by them! Enjoy your time at the coast! Not sure which part you are visiting, but it is all lovely! Also very busy this time of year. 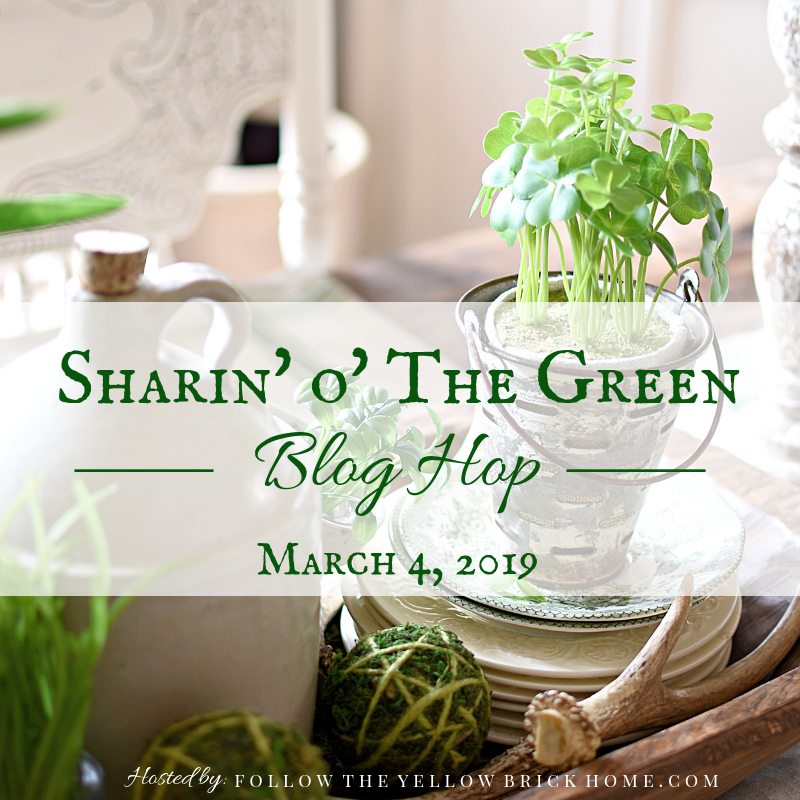 Love your quaint little kitchen! I love your cheery kitchen! Your red check plates are darling. Hope you found cooler temps in Oregon! 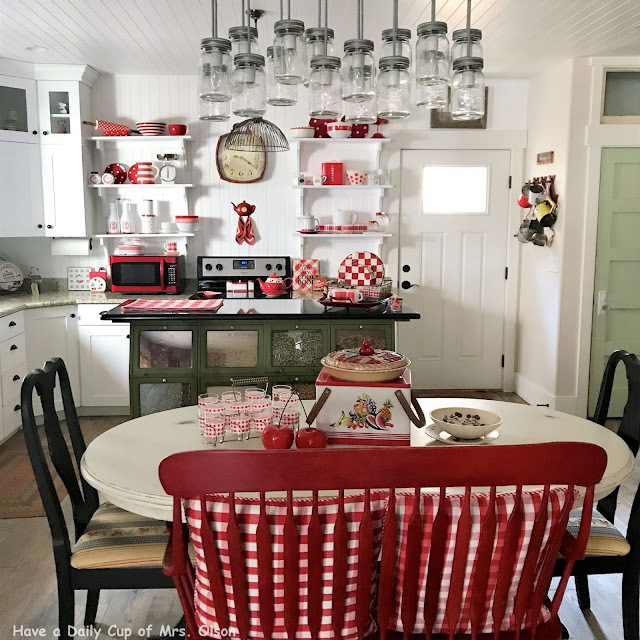 I REALLY LOVE your pretty red and white kitchen! Red is such a cheery color...you have a very neat collection of vintage in here, and it reminds me so much of my Mom. Her favorite was our "yellow" kitchen, but before that I am pretty certain that it was red and THAT was my favorite. That was back in the 60's/early 70's when I was growing up. Wish I could talk Carl into a red kitchen. Living where the winters are snowy (Ohio), it would really be so nice to see this color. But I love red enough to enjoy it no matter the season. The red microwave is awesome! 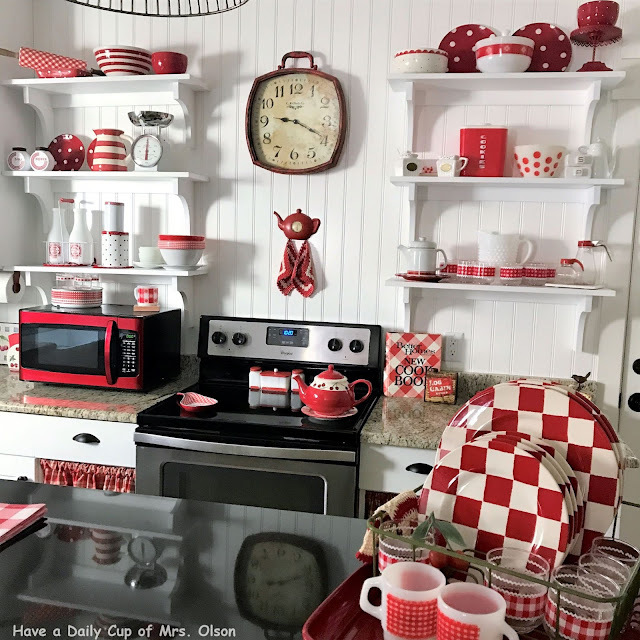 Oh my goodness that kitchen is perfect, including the red microwave! 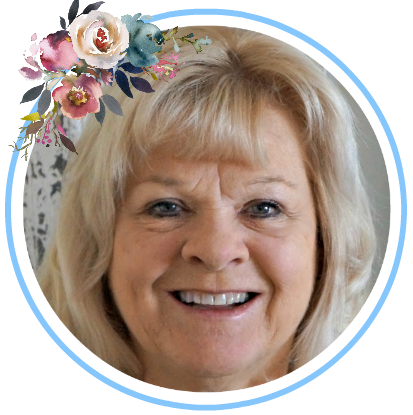 Have fun on your getaway, Jann! Holy cow! So cute! I just go ga ga over gingham, especially red. I have lots of red accents in my kitchen and some gingham too. You do more with your basement kitchen than most of us do with our regular kitchens! This is so darned cute I want to move into your basement? May I?! I love it! Have a wonderful break and "see you" soon! Jann, oh those red and white everything makes me smile! I love the vintage flavor. Very sweet!! Jann, your basement kitchen is so adorable, I could move right in. Have a great trip! 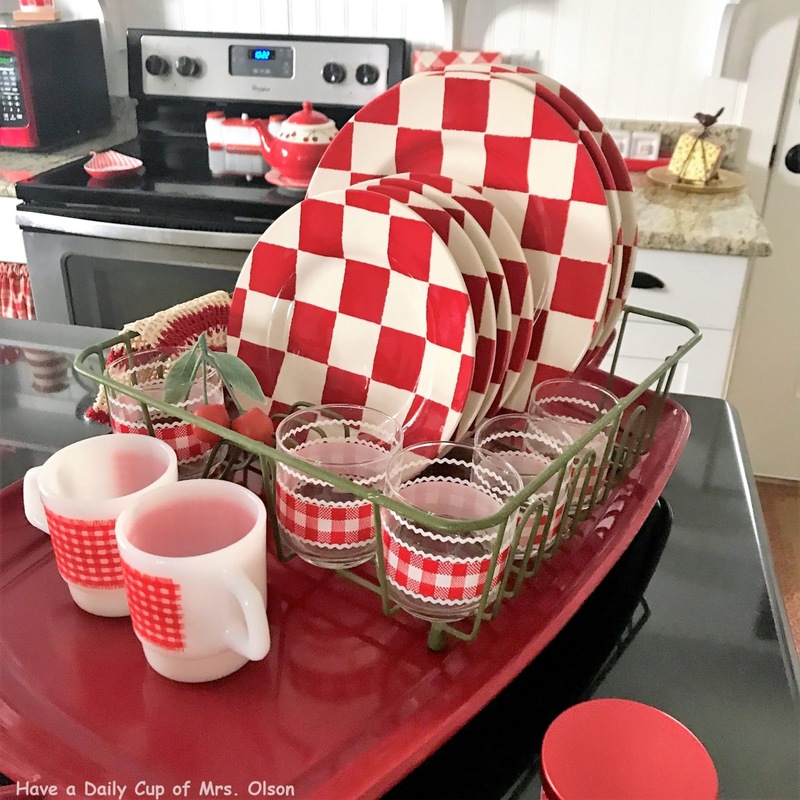 I have several red items the same as yours - I just wish I had bought more than one of those red and white check plates! Vintage beauty of a kitchen! Happy and fun. 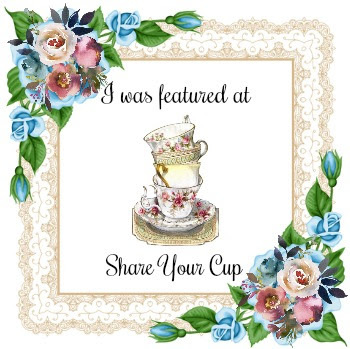 Thanks for sharing your darling kitchen at Vintage Charm--pinned!